Healing properties of strawberries known since the most ancient times. This berry helps to stabilize the cardiovascular system, liver, kidneys, gastrointestinal tract. In addition, strawberries are incredibly tasty, so is always welcome at any table. The easiest way to get a lot of planting and to propagate strawberries with a mustache. Take for landing only the first mustache with the beginnings of roots. Tear off the mustache from the parent plant as a whole. To keep straightness of rows, place them on the cord. Make using scoops pits with steep wall at the cord. The seedlings get to a steep wall so that the soil line strawberry was at the level of the soil. The roots spread. If they are too long, they can be slightly trimmed. Strawberry does not tolerate any small or deep planting. In addition, it is impossible to fill the earth terminal Bud, as this will lead to the death of seedlings. For the best survival roots dipped in a mash of clay and mullein before planting. The hole fill in loose soil, the soil around the plant will seal, then add a little more soil and again condense. Around each plant a shovel make a small hole into which pour half a liter of water. Correct bushes carefully, the rows multiroute humus. Pricenice paper or swisscolony grass. The following year the young bushes will again get a mustache, and you will be able to obtain new planting material. Another way to propagate strawberries – seeds. Sow them in February in plastic cups filled with fertile potting mix. Since the seeds are very small, then put them on the soil surface and lightly sprinkle the ground. Moisten with spray, cover with glass and put in a warm bright place. While seeds will not germinate, periodically priotkryvaet glass, remove the condensate and moisten the soil. The seedlings will appear in about a month. Now the glass can be removed. By the end of spring, you should receive three or four sheets. After the threat passes the return of frost, plant seedlings in the garden and pricenice paper or grass. 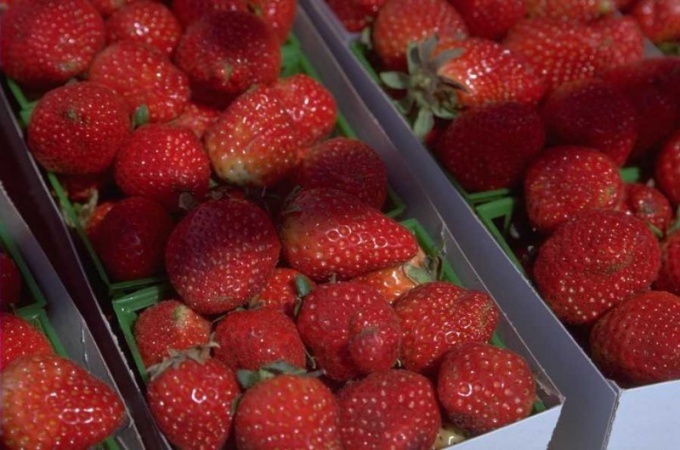 Strawberry – one of my favorite berry growers. It grows in almost every garden. But to weed it weed – sheer torture. To avoid this unpleasant procedure, you can plant strawberries under the covering material. But if you want to save money on seedlings, grow it from seed. 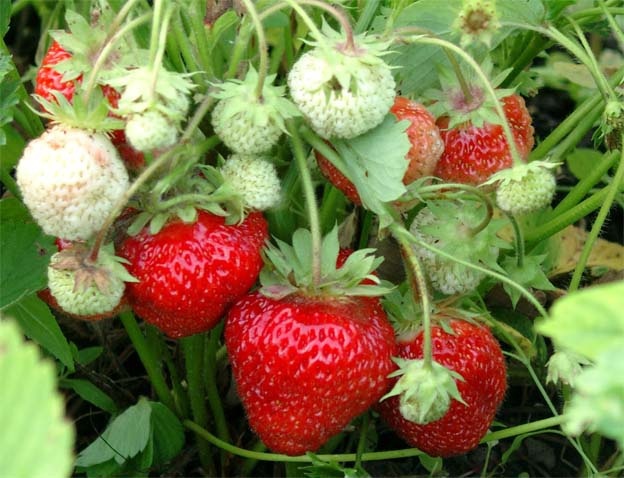 Buy seeds varietal berries and sow them in the month of February. The procedure is quite simple – take a regular soil for seedlings, poured in the container, thoroughly moisten, tamp, and put on top of the strawberry seeds. In the instructions on the bags are usually advised to cover them with earth or sand, but it is better not to do it. Top cover the container with the seeds with plastic wrap or glass and put in a warm place. When sprouts appear, remove covering, capacity put on the light. Maintain constant soil moisture. When I grow up 1-2 true leaf, seedlings to dive down into individual peat pots or disposable cups, boxes yogurt, etc. After the ground has sufficiently warmed, you can plant strawberries. First, properly prepare the soil. If you are going to plant the old garden, to fertilize it with humus or compost. But better to take unspoiled land. Trim and push the weed, but in any case, do not dig and do not pull out, they will decompose and become fertilizer for sweet berries. Moisten the ground. Top top future klubnichniy roofing material, powder up. All edges and joints close the boards or bricks. Instead of roofing material you can use cardboard, dark film and other similar materials. But they will last only one season, the same roofing material – 3-4 years, that's how much strawberries are recommended to grow in one place. Mark the location of the bushes. For each cut in the roofing material crosswise a small hole. On a single sheet must be placed no more than three, and preferably two rows of plants. The distance between rows and 40 cm between the bushes – 20 cm Thin stick make a small hole, fill it with water. Take the Bush of the strawberry and carefully, trying not to damage it, place the roots into the hole, pushing aside the edge of the roofing material. Transplant completed. This method of planting is good because under the roofing material long moisture is retained, so the strawberries can be watered less frequently. In addition, almost do not get out of the weeds, and some occasionally appeared enough to cut with shears.